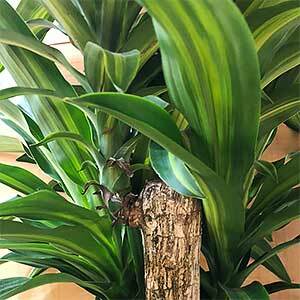 With bright and cheerful foliage, Dracaena Massangeana is sometimes called the ‘Happy Plant’. It has a number of common names including the corn plant. Widely grown as an indoor plant, the plant is also said to be a good air purifier, it helps remove ra range of common indoor air pollutants including trichloroethylene, and benzene amongst other toxins. 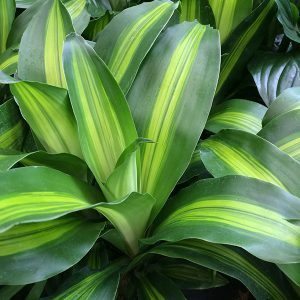 With luxuriant foliage, a glossy green with strong contrasting yellow to green variegation running down the centre of each leaf, it certainly lives up to its name. It is also easy care, and can be pruned if needed. As the name suggests it does have a fragrant flower in winter, the flowers are a creamy white and appear on a long flower spike, the fragrance is strong and some people remove the flower. The flower is said to bring good luck, especially when it flowers in summer. Generally very easy care in warmer temperatures. It like good filtered light. Soil needs to be well drained, with more moisture during summer months than winter. This a plant that prefers to have a confined root run, so before repotting check the root system and only move it to a larger pot if it appears root bound. Although this is grown as an indoor plant it does appreciate some time outdoors. The best time to move it outdoors is at the beginning of summer. Place it in a position with good filtered light rather than direct sun. This is also a good time to wash down the foliage to remove dust. Repotting every 4 years is recommended. Position – Good filtered light. Soil – A well drained soil is essential, wet soils will cause problems with the roots system. Foliage – Green with pale yellow variegation. Flowers – Creamy white and fragrant. Height – Over time the plant can reach 3 metres (10ft) plus. As the plant grows and gets taller you will eventually want to lower the height by pruning. This can be done at any time of the year. Use a pruning saw or very sharp knife to remove the top of the stem to the desired height, allowing for regrowth of foliage. The stem should reshoot within 2 – 3 weeks. You can use the pruned sections for propagation if you wish. Prune the plant as the plant gets taller and the lower foliage looses its attractiveness. Simply cut the stem back to the desired heigh and it will form new heads. The best time to prune is when the plant is in active growth in spring to summer. Two methods of propagation are widely used. Remove any lower foliage from the stem. Choose a pot that is just a little larger (twice to thee times as wide) than the stem itself. Reduce the length of the stem cutting to around 30 cm (12 inches) in length. Place the stem cutting in the pot and backfill with potting mix. Place the cutting in a shaded position and keep just moist. New growth and new roots should form within 3 – 4 weeks. Cuttings can be taken and then rooted in water. The water will need to be changed every 4 days to keep it fresh. Once good root growth is evident the plant can be potted up. Soil – Moist and well drained. Height – To around 3 metres, easily pruned to 1 metre. Flowers – Fragrant white flowers on long stems. Foliage – Mid to deep green, or variegated.